Within hours of the attacks on the World Trade Center, misdirected assaults on Sikhs and other South Asians flared in communities across the nation, serving as harbingers of a more suspicious, less discerning, and increasingly fearful worldview that would drastically change ideas of belonging and acceptance in America. 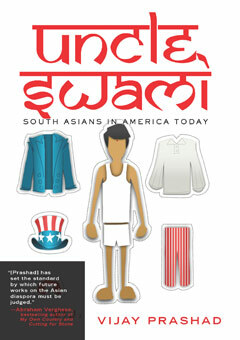 Weaving together distinct strands of recent South Asian immigration to the United States, Uncle Swami creates a richly textured discussion of a diverse and dynamic people whose identities are all too often lumped together, glossed over, or simply misunderstood. Continuing the conversation sparked by his celebrated work The Karma of Brown Folk, Prashad confronts the experience of migration across an expanse of generations and class divisions, from the birth of political activism among second-generation immigrants and the meteoric rise of South Asian American politicians in Republican circles to migrant workers, who are at the mercy of the vicissitudes of the American free market. A powerful new indictment of cultural and racial politics in America at the dawn of the twenty-first century, Uncle Swami restores a diasporic community to its full-fledged complexity, beyond both model minorities and the specters of terrorism.